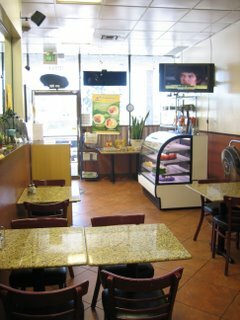 It wasn't long ago that pho, the acclaimed beef noodle soup of Vietnam, seemed like it was on the cutting edge of a new and exotic cuisine. If Vietnamese was the new Thai, pho was the new pad thai. But after over a decade of consuming hundreds of bowls at dozens of joints large and small, spotless and grimy, I am suffering from pho fatigue, or as I like to call it: "pho-tigue." Relegated to the "been-there-done-that" bin in my brain -- along with teriyaki and too many plates of kung pao chicken -- it seems that every bowl of pho I slurp is virtually indistinguishable from the next. 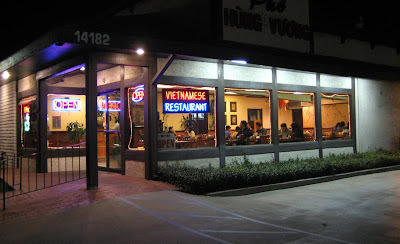 At Pho Hung Vuong in Tustin, their titular dish is, of course, pho. And although the restaurant does a decent and faithful version of it, my attention gravitates elsewhere, to somewhere on the back page of the menu. It's there that I've found my new noodle soup obsession. 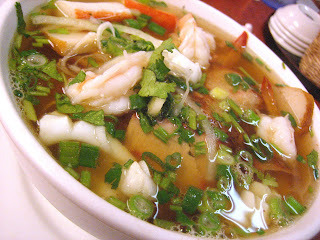 Its name: Hu Tieu Mi Dac Biet ($6.25). It starts, as all things noodle soup does, with the broth. And it's a gorgeous brew, lovingly culled from pork and chicken, and harnessing all of its essence. In my bowl, floating bubbles of melted fat skitter across the surface of the liquid, like disembodied spirits possessed with flavors both sweet and savory. Garnished artfully with chopped cilantro, scallions, and heightened by a squeeze of lime, this hot, soothing nectar is simultaneously rich and refreshing -- a lip-smackingly good and honest soup. Each sip energizes the palate, entices the gullet, and warms the soul. Submerged beneath the shimmering elixir you'll find not one, but two types of noodle, existing in a dichotomy of textures -- a veritable yin/yang of starches. 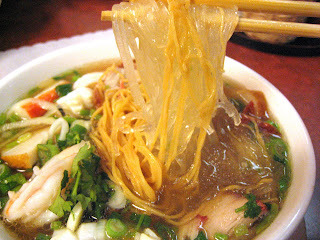 Gelatin-clear, stretchy and elastic strands of chewy hu tieu constitutes the yin. Its yang is a firm and crinkly yellow egg noodle called mi. The pair are entwined in a lustful embrace, like lovers in a jacuzzi of boiling broth. But they aren't alone. Among the many bearing witness to the delicious affair are four jumbo shrimp as big as a toddler's fist, barely cooked to a jiggly perfection. The rest of the motley crew include: thick and floppy rectangles of fish cake; wispy, razor-thin slices of red-rimmed xa xiu (barbecued pork); turgid cylinders of krab; and blanched, white curls of calamari. Pho may still be the reigning king of Vietnamese noodle soup, but at Pho Hung Vuong, I worship at the altar of its rightful heir: Hu Tieu Mi Dac Biet. Thanks to the work of a public relations pioneer named Edward Bernays, when you think about an all-American breakfast, two words will undoubtedly come to mind: bacon and eggs. His PR push convinced millions of Americans that there was no better way to start the day than by consuming a product sold by his clients. I, myself, recall scarfing down a daily breakfast of Sizzlean and scrambled eggs before I scurried out the door to gradeschool, never questioning until now: "Why eggs? Why bacon? And what the heck is Sizzlean made out of anyway?" It is doubtful that Bernays' influence extended to the island nation of the Philippines. But one has to wonder why no other country in Asia offers a breakfast like the Filipino almusal. So similar is it to its American counterpart that it becomes hard to deny whether Bernays' work might have had something to do with it. Principal components of the meal consists of the staples he strived to popularize: salted cured meats and eggs. The only difference, however, lies in the fact that in the Pinoy version, fried rice takes on a major role as carbohydrate, and there's usually a vegetable involved, often a slice of fresh tomato. 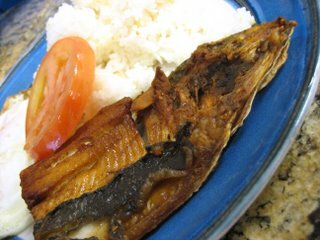 But the dish is such a constant in Filipino households that it is referred to by its shorthand, which always ends in a silog suffix. The moniker is a concatenation of its components. 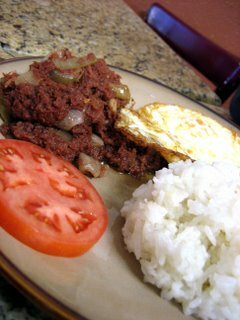 For example, take one dish called longsilog, which includes a Filipino sausage called "longanisa", fried rice ("sinangag"), and a fried egg ("itlog"). Longanisa + sinangag + itlog = longsilog. Whatever you call it, it's a big breakfast designed to provide long-lasting fuel for a hard day of labor. But for a person who now sits in front of a computer all day long, the cumulative effect of such a substantial morning meal, no matter the country of origin or history, is that it's too much fat, too much cholesterol, too early in the day -- which is why I save it for lunch. One place in Orange County that specializes in the almusal is a family-run joint called Kapamilya. 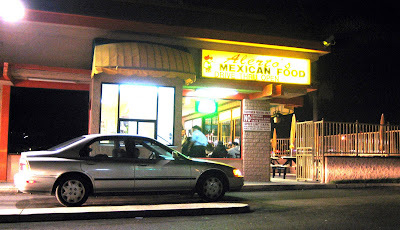 In this hidden Fountain Valley stripmall eatery, several varieties of silogs are cooked to order and offered all day (Monday to Friday 10:30am to 6:30pm, Saturday 8:30am to 2:30pm) for a flat fee of $4.75 (tax already included). 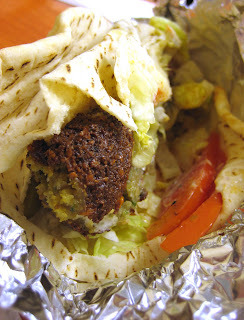 From three visits, I tried four of their offerings. 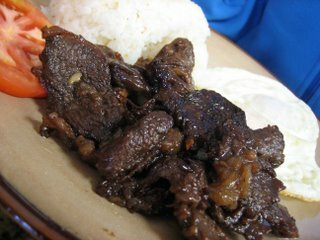 Tapa, one of the more traditional choices for Filipino breakfast, is beef marinated in garlic, sugar, soy sauce, and vinegar. 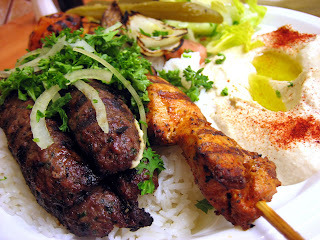 The texture of the meat is similar to Korean kalbi, but a bit dryer by design, straddling the line between jerky and steak. The flavor, however, is ten times sweeter than its distant Korean cousin, and without its characteristic sesame oil nuttiness. Corned beef is prepared the way the Pinoy palate prefers it, cooked moist to an almost Sloppy Joe consistency and decorated with ribbons of wilted onion. The ruddy scoop of salty, soppy meat goes especially well with the rice and eggs. 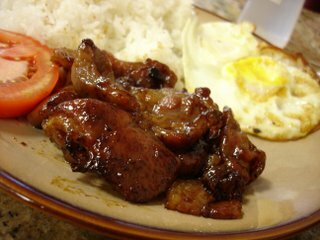 To save time, restaurants typically use factory-produced tocino, which although delicious, contains nitrites and artificial coloring. 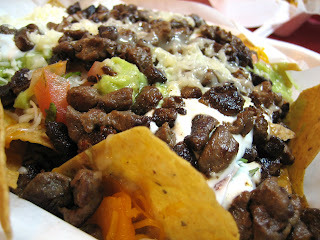 Kapamilya chooses to make theirs from scratch, utilizing fatty cuts of pork. Coated with a candy-sweet glaze and tooth-tender, their tocino resembles Vietnamese grilled pork with an amped up sugar qoutient. To counter its cloying flavor, I balance it with tart shots of vinegar. One of the lighter proteins is the boneless bangus, crisply fried marinated milkfish. Blessed with a prized yogurty tang and a flaky white flesh, this is one of my favorites for almusal, and something that Edward Bernays definitely had nothing to do with.